There are many subwoofers available on the internet. Not many of them are adequate* when it comes to both accurate musical reproduction and creating home theatre impact. Our Direct Servo Technology enables us to create high performance subwoofers which reproduce deep bass very accurately. If this sounds like exaggerated sales talk, look at our technology section where we back it up. Our prices are as affordable as we can make them, and our new range of products are very flexible to suit any high end system. Click on the product category below or the top pull down menu. 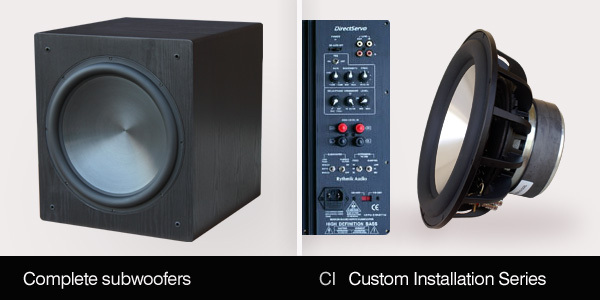 With our new expanded product range, we have a subwoofer solution for every high end system. All of our products feature our Direct Servo technology. We have affordable 12" and 15" subwoofers available in finishing options. Our signature edition products feature a stylish piano gloss finish. For those looking for a unique custom product, we provide our Custom Installation (CI) series products. Products in our CI range include the driver and Direct Servo amplifier. One can then source a local furniture maker and save on shipping. Architectural solutions are also possible, where the subwoofer is built into the room. In this way even large subwoofers with multiple drivers can be made invisible. This can help greatly in achieving spouse approval. Our CI range also suits those who prefer to build the cabinet themselves. The savings can mean being able to buy multiple subwoofers in many cases for a price which is still less than competitive products. We supply free box plans or can advise customers who wish to design their own box.